When Oshkosh live-in caregivers plan to take the seniors in their care on vacation, there are numerous things to consider. 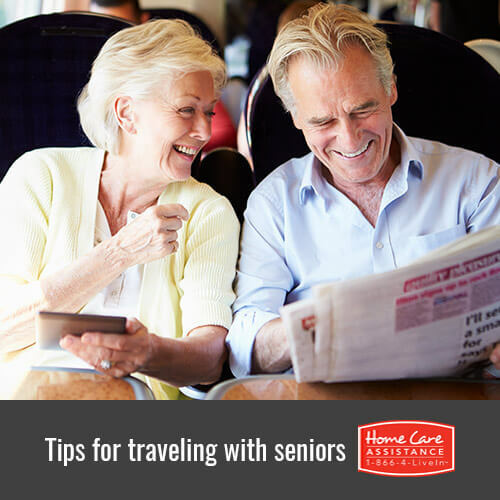 While planning a trip for you and your elderly loved one, consider some of these useful travel tips to avoid complications. It is best to scale back physical activity and build rest periods into your itinerary to keep your loved one from becoming too tired. A simple day trip to a lakefront cottage may be more enjoyable for your loved one than a trip to a theme park that requires a lot of walking. If you are going to visit any attractions, call ahead to ensure they can accommodate any special needs such as wheelchairs or walkers. Your loved one’s medications along with a dosing schedule. A hat and sunscreen if you plan to be outdoors. An extra change of clothes if your loved one is incontinent. Seniors with dementia often become more agitated and fearful in the late afternoon or early evening. Oshkosh dementia caregivers can prevent this by not planning activities that could be loud and overwhelming during these times. Instead, try to get home or to your hotel by dark, close the curtains, and turn on lights to lessen the transition from light to dark. Routine is especially important for seniors with dementia. Do your best to keep meal, medication, and bedtimes as close to normal as possible. You can also help your loved feel more comfortable in the new environment by bringing a favorite object from home such as a blanket, pillow, or article of clothing. If your loved one shows signs of agitation, be willing to adjust your plans. Go back to your hotel or find another quiet place where he or she can relax and calm down. Plan plenty of extra time into your itinerary so that your loved one does not feel rushed. You might also defer to Oshkosh, WI Home Care Assistance for help planning a trip with your loved one. Our dedicated live-in and hourly caregivers are always available to help seniors of varying physical and cognitive ability with daily activities including medication reminders, prescription pick-ups, personal care, and more. To learn more, call (920) 710-2273 and schedule a free consultation with a knowledgeable Care Manager.